We will hold event of Rakugo in English, coming April. 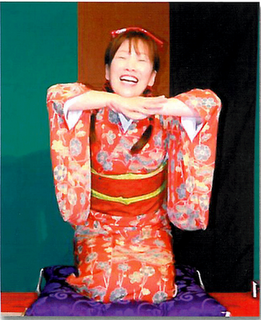 We will have rakugo performer Sayohime, she will demonstrate what is Rakugo and have workshop after her performance. Rakugo is a 400 year-old form of comedic Japanese storytelling that is still popular today. The story teller kneels on a Japanese cushion to tell a funny story written in dialogue format and uses two props ; a fan and Japanese cotton towel which can become many things such as wallets, or chopsticks. It had become the custom to include a "punch line" at the end of the story for added effect. Sayohime profile: When I was student, I devoted myself to performing musicals. I have performed Rakugo in English not only in Japanese but also in forein countries. (NY in 2005 NZ in 2006 SF 2007)since 2002. I watn to perform in smaller spaces where I can have a closer connection with my audience. I look forward to sharing the joy of Rakugo with you! * Date- April 1st, 8th and 16th *Time- 19:00-19:50 *Charge- FREE *Program- Introduction to Rakugo Sayohime’s performance Workshop *Place- NISHIYAMA RYOKAN Kyoto Nakagyo-ku, Gokomachi, Nijosagaru, Yamamoto-cho 075-222-1166 http://www.ryokan-kyoto.com/ 3mins walk from Subway Tozai Line, 'Kyoto shiyakusho-mae Stn' Zest-Oike Exit #10 3mins walk from 'Kyoto shiyakusyo-mae bus stop' Kyoto city bus #4, 205,17 from Kyoto Stn. As you know, the magnitude 9.0 earthquake hit northeastern Japan on 11 March. I was working here in Kyoto at the moment. I heard about it on TV and i did not believe what i saw. The huge tsunami attacked many people, buildings and atomic power plants..
Now Japanese have faced huge difficulty. But certainly we can overcome this disaster. Because we know many people from all over the world prays for Japan and have donated lots of money and things. We also got many warm messages. I have donated money too (a bit though), and trying to cut down on electricity usage that only i can do right now.. Thoughts and prayers are with people suffered from the earthquake. We had a family from Italy a couple days ago. They were on their holiday and visited Japan with a child of 3 years of age. The boy explored everywhere, then cried and yelled as most children do. His mother looked busy taking care of him all time. In the morning they came down to have breakfast. As you can imagene, the boy could not keep quiet in the room. His mother was worried if they bothered other guests because of him. So,we thought if there is anything we can do for them, and decided to play with him when his parents are having breakfast. We gave him a toy- Its soap bubbles. We were glad that he enjoyed blowing soap bubbles. I think it should be hard for a family to travel with their infants. Thats why helping them will be my great pleasure.